As was normal, examples of new designs, colour trials etc. were sent to the King for his approval. The majority of these were never returned and ended up in the Royal Collection, causing much consternation amongst the Post Office record keepers who were unable to account for missing items. Eventually it became official policy that copies of all items would automatically be sent to the King 'for his collection'. 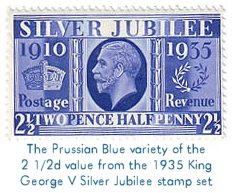 The first stamps of George V were prepared under unusual circumstances. For over 30 years De La Rue had held the monopoly, on their terms, for the entire process of producing stamps, including plate making, printing and perforation, but in 1910 their Contract was due to expire and was put out to Tender. Much to their surprise De La Rue lost the Contract, on price, which went to Harrison & Son, a well established firm of security printers, but with no experience in stamp production. The plates were to be made at the Royal Mint, who although having centuries of experience in engraving coins and medals, had no experience in stamp plate engraving. Later Grover & Co were asked to produce perforating machines, which they did successfully. The new stamps were the work of two artists, Bertram Mackennal and George W Eve. Eve had been one of the artists originally invited to submit designs whilst Mackennal, who was also designing the coinage, had been suggested by the King, who was not satisfied with the original designs. When the first stamps, which bore a three-quarter profile Head, suggested by the King and taken from a photograph by W & D Downey, were issued on Coronation Day only the 1/2d and 1d were available and resulted in a storm of criticism. In some official circles this came as no surprise and in fact work had already started on trying to improve the appearance even before the first stamps were issued. The problem was that the Postmaster General had stated in Parliament that the new stamps would be available on Coronation Day, hence the release of stamps which some people already knew were not up to standard. As usual in such circumstances everyone tried to pass on the blame to someone else. The Board of Inland Revenue, responsible for stamp production, blamed the printers (a) for using calendered instead of plate-glazed paper and (b) for using Michele printing machines instead of Wharfedale. Harrison's denied these factors had any bearing and claimed that they had not had any opportunity to test-print any of the plates; these had been available too late which the result that stamp production had to commence immediately. There is no doubt some justification in Harrison's claim, but it is a fact that by the time the full Profile head stamps, which eventually replaced the original stamps, appeared, plate glazed paper was being used and printing done on Wharfedale machines.